The image processor Venus Engine is newly developed with new quad-core CPU that enables high speed signal processing. Combination of new Digital Live MOS Sensor and the Venus Engine dramatically improves sensitivity (max.ISO25600), gradation performance, resolution and color reproduction to achieve even higher picture quality. Yet its image description is natural – that is what LUMIX aspires for. The new DMC-GH4 further evolves to meet professional quality and standard with the capability of 4K (Cinema 4K: 4096×2160 / 24 fps and QFHD 4K: 3840×2160 / up to 30 fps) video recording in MOV/MP4 or ultra high bitrate video recording at 200 Mbps (ALL-Intra) or 100 Mbps (IPB) without recording time limit. *1 *2 In addition, a variety of practical functions required for professional video recording are newly integrated. One of the most prominent features of GH4 is unlimited *2 4K video recording (Cinema 4K: 4096×2160 / 24 fps and QFHD 4K: 3840×2160 / up to 30 fps) in MOV/MP4 *3. The DMC-GH4 is also capable of real-time image output (4:2:2 / 8 bit or 4:2:2 / 10 bit) to the external monitor via an optional micro HDMI cable*. It is suitable for the professional video making that requires serious monitoring of the imageries. Users can choose to output only the recording content or the content with the setting menus individually depending on a display.When using 4:2:2/10-bit output, simultaneous video recording on SDXC/SDHC Memory Card in the camera is not possible. When using 4:2:2 / 8-bit output, video is recorded in 4:2:0 / 8-bit on SDXC/SDHC Memory Card in the camera. The DMC-GH4 integrates Wi-Fi® connectivity (IEEE 802.11 b/g/n) with NFC (Near Field Communication) technology. With the “Panasonic Image App”, remote shooting of photo / video is available with smartphone / tablet. It is also easy to embed geotag in the image after shooting. For the smartphone / tablet without NFC, the camera displays dedicated QR code on its monitor to complete pairing easily by reading the code. A 2.07MP Full HD CMOS sensor – designed and manufactured by Canon – captures Full HD video at native 1920×1080 resolution. The sensor is equipped with a Bayer pattern colour filter for high sensitivity and wide dynamic range; high-speed data readout technology minimises rolling-shutter skew that can occur in CMOS camcorders. The E1 by Z Camera gives 4K (4096×2160) image quality from a camera with dimensions no larger than that found on an action camera. Housed in a magnesium alloy body, it is lightweight and therefore ideally suited to POV and aerial (UAV) photography. It records 4K movies (4096×2160) as well as UHD (3840×2160) at a bit rate of 60Mbps. In addition, the E1 can record Full 1080p HD movies at up to 60fps, and 720p with the ability to record at 240fps in this lower resolution format but then with the option of presenting slow motion playback. Due to the power of the Panasonic imaging sensor, the E1 is also capable of recording 16 megapixel still images with an option of recording in RAW. 3D noise filters also ensure lower noise levels in low lighting conditions, especially important when making the most of the maximum ISO sensitivity of 25,600. Burst shooting at up to 15fps is also attainable. In both still and movie recording modes, the E1 will autofocus continuously, with user-defined variation in focus sensitivity. For manual focusing, there is even a zoom-in feature to ensure focus is pixel-sharp. This camera is suitable for both Wi-Fi and Bluetooth camera control by mobile devices using Android or iOS operating systems, as well for monitoring and powering on or off, giving you a true remote control option essential to UAV and POV applications. 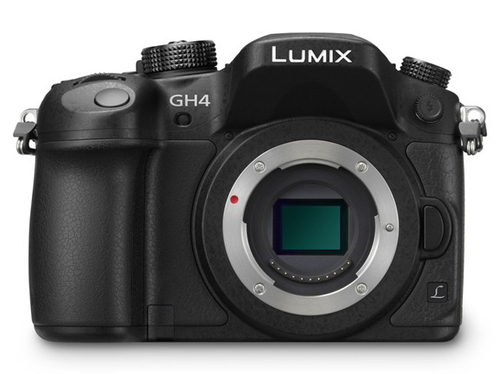 4:2:2 10-bit Internal Recording The LUMIX GH5S brings game changing internal 4:2:2 10-bit C4K/4K video recording. For example, 10-bit will render all the subtleties of graduated skies and sunsets without the banding so prone to 8-bit. The power of having film creation capabilities inside the camera sets a new precedent in guerilla style filmmaking. And you can record 4:2:2 10-bit to SD card whilst simultaneously feeding the live signal thru a full-size HDMI port* connected to an external monitor or recorder. 4:2:2 10-bit recording enables faithful color and grading fidelity with over a billion colors and four times the tonality of 8-bit to match professional intent. *C4K/4K 60p/50p is output only. Cinema 4K 60p/50p* with Unlimited Recording Time The original LUMIX GH5 made it possible to record 4K 60p/50p video on a DLSM camera. Now, to greatly extend your creative possibilities, the LUMIX GH5S takes this even further and, for the first time ever**, includes Cinema 4K (C4K: 4096 x 2160) 60p/50p* video recording . Moreover, there is no limit*** to the recording time, not even when shooting FHD or 4K video. TC IN/OUT Terminal The time code can be synchronized with an external device by using the bundled BNC conversion cable. This enables easier non-linear timeline editing of footage shot with multiple cameras. LINE Input Supported LINE input is supported by a 3.5mm mic jack. This makes it possible to input sounds from an external audio device, for more efficient video production. Max. 10x Slow Motion Video — VFR (Variable Frame Rate) To elevate video expressivity even further, a variety of effects are available on the LUMIX GH5S. The VFR lets you record overcranked / undercranked videos in C4K/4K (60-fps maximum 2.5x slower*) or FHD (240-fps maximum 10x slower*) quality. The minimum frame rate for quick motion effects video is 2-fps. Pre-installed V-LogL Video Recording Function A neutral or flat logarithmic (“log”) gamma curve captures wide dynamic range pictures ideal for color grading. Plus, a LUT Display function assists your exposure and helps to show directorial intent (e.g., use V-logL to Rec.709 LUT for an HDTV look). Hybrid Log Gamma for 4K HDR Video HDR (High Dynamic Range) is a mode to reproduce both the bright parts and dark parts of an image, making it look just as the human eyes see it. You can choose Hybrid Log Gamma (HLG) in Photo Style. Top features: – QuikStories edits your video automatically on the app – 4K Ultra HD video at 60 fps for stunningly smooth movies – Improved image quality with the all-new GP1 chip – Built-in WiFi for quickly transferring videos and photos – Durable design is waterproof to 10 m without housing QuikStories Spend less time messing about in the video editing suite and more time sharing your videos. QuikStories means your videos are sent straight from your GoPro HERO6 to your smartphone, where the app transforms it into a stunning edited video, ready for you to share. Choose from a range of templates, including transitions and music, or customise it further by trimming your video and adding filters. You’ll then be able to save or share it to your friends and followers, without needing to spend hours editing. 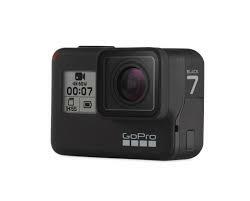 4K Ultra HD video You’ll be able to shoot stunningly detailed and smooth professional-quality video with the GoPro HERO6. 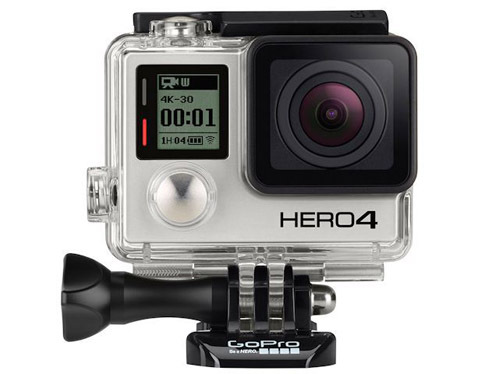 Offering twice the performance of the HERO5, you can capture 4K Ultra HD video at 60 fps, or Full HD 1080p video at 240 fps for brilliant slow motion effects. It’s easy to start filming too thanks to the voice-control feature. Simply tell it to start or stop recording and it will do the hard work for you. 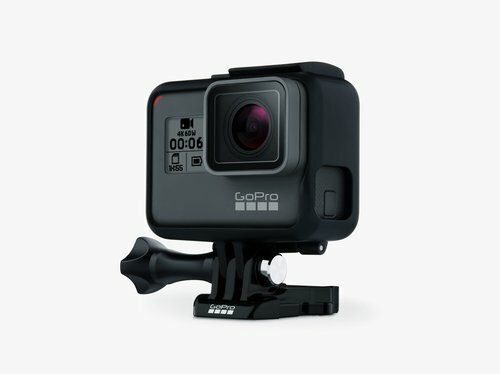 Improved image quality The all-new GP1 chip is optimised for GoPro capture, ensuring improved image quality and smooth, stabilised footage. Advanced video stabilisation further assists with smooth, blur-free footage, whether the camera is handheld or mounted to your gear. Built-in WiFi With 5 GHz WiFi, transferring videos and images to your phone or PC is faster than with the HERO5, meaning you can quickly edit and share with less waiting around. GPS captures your path, speed, elevation gain, and more which can then be added to videos on the Quik desktop app. Photos to Impress, 4K Videos to Inspire The GH4’s new Live MOS Sensor and Venus Engine team up to reduce noise while raising resolution and improving color reproduction. Innovative DFD technology increases the speed of Contrast AF. As the world’s first* DSLM camera to record 4K videos, it truly meets the needs of professionals. Superb Picture Quality for Lifelike Textures The image processor Venus Engine is newly developed with new quad-core CPU that enables high speed signal processing. Combination of new Digital Live MOS Sensor and the Venus Engine dramatically improves sensitivity (max.ISO25600), gradation performance, resolution and color reproduction to achieve even higher picture quality. Yet its image description is natural – that is what LUMIX aspires for. Video Creation to Meet Pro Quality The new DMC-GH4 further evolves to meet professional quality and standard with the capability of 4K (Cinema 4K: 4096×2160 / 24 fps and QFHD 4K: 3840×2160 / up to 30 fps) video recording in MOV/MP4 or ultra high bitrate video recording at 200 Mbps (ALL-Intra) or 100 Mbps (IPB) without recording time limit. *1 *2 In addition, a variety of practical functions required for professional video recording are newly integrated. *1 Motion image can be recorded up to 29 min 59 sec depending on the recording format and the camera’s sales area. *2 Use SDXC/SDHC Memory Card compatible with UHS Speed Class 3 (U3) when using high bitrate video recording mode over 100 Mbps. Superb Mobility & High Speed Response Superb mobility and high speed response come equipped with DMC-GH4. The high-precision Contrast AF now integrates DFD (Depth from Defocus) technology to achieve ultra high speed AF of approx.0.07 sec*.The burst shooting power is also boosted to12 fps(AFS). Both 2,359K-dot LVF (Live View Finder) and 1,036K-dot rear monitor adopt OLED to minimize time lag while enhancing the resolution. Reliable Durability To be tough enough to withstand even heavy field use, the main structure of the DMC-GH4 is composed of magnesium alloy full diecast front / rear frame. It also features splash / dustproof construction thanks to the sealing on every joint, dial, and button. The shutter unit is also redesigned to be even more durable for approx. 200,000 times release*. *Panasonic in-house examination. Expandability for Flexible Usage To offer more flexible usage, the DMC-GH4 even incorporates Wi-Fi® with NFC Technology or in-camera RAW development capability. It also complies with External Flash (DMW-FL580L), Stereo/Shotgun Microphone (DMW-MS2) or Battery Grip (DMW-BGGH3) to support professional photography/videography. The expansive flexibility of DMC-GH4 goes far beyond the limit of conventional Digital Single Lens Mirrorless camera. 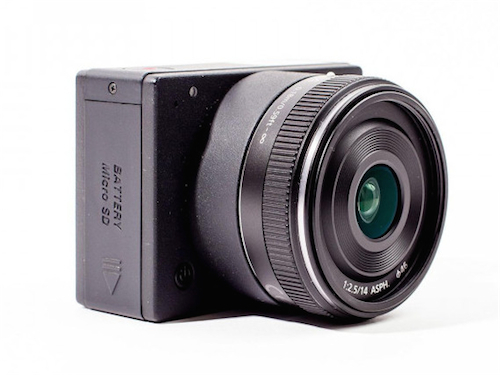 New 16.05MP Digital Live MOS Sensor The new 16.05-megapixel Digital Live MOS Sensor achieves high quality, high sensitivity image recording with its quick response. Approx.50% higher speed signal readout suppresses rolling shutter effect when using electronic shutter or recording video. Taking full advantage of the Live MOS Sensor, gradation range is expanded by max.1/3 step at low ISO end. Plus, superior noise reduction allows max.60 min long exposure. Advanced Image Processor Venus Engine The image processor Venus Engine is also newly developed dramatically boosting its performance with quad-core CPU that enables high speed signal processing required for rich video recording such as 4K. Integrating superior noise reduction systems, DMC-GH4 enables shooting at max.ISO25600. Sensitivity, gradation performance, resolution and color reproduction are dramatically improved to achieve even higher picture quality. Focus Peaking Focus Peaking function shows the peak of focus in MF and AF+MF mode. Users can see the peaking of focus while monitoring the subject in live view. It is also available in remote photo / video shooting with smartphone / tablet via Wi-Fi. Highlight / Shadow Control Highlight and shadow can be separately adjusted with the front/rear dial. 3 patterns of settings can be customized in addition to 3 preset patterns. RAW Data Development in Camera The DMC-GH4 is capable of developing RAW image in camera. In addition to the color space setting (sRGB / AdobeRGB), the parameter of white balance, exposure compensation, contrast, highlight / shadow, saturation, noise reduction, sharpness or hue can be flexibly adjusted while LUMIX’ s Photo Style, Intelligent D-range Control, Intelligent Resolution can also be applied. Photo Style You can choose color / texture type for photo / video from Standard / Vivid / Natural / Monochrome / Scenery / Portrait. Contrast, sharpness, noise reduction, saturation and hue parameter for each mode can be adjusted and memorized in camera. Electronic Shutter & Silent Mode The DMC-GH4 offers practical electronic shutter. The high-speed signal readout achived by Live MOS Sensor minimizes rolling shutter effect. The Silent mode switches shutter from mechanical to electronic and turns all sound (AF, operation) off while suppressing emission of AF assist lamp and flash with just a single setting for special shooting occasions. World’s First *1 4K Video Recording One of the most prominent features of GH4 is unlimited *2 4K video recording (Cinema 4K: 4096×2160 / 24 fps and QFHD 4K: 3840×2160 / up to 30 fps) in MOV/MP4 *3. *1 For a DSLM as of Feb 7, 2014. *2 Motion image can be recorded up to 29 min 59 sec depending on the recording format and the camera’s sales area. *3 Use SDXC/SDHC Memory Card compatible with UHS Speed Class 3 (U3) when using high bitrate video recording mode over 100 Mbps. Versatile Video Recording Formats The DMC-GH4 is also capable of ultra high bitrate video recording at 200 Mbps (ALL-Intra) or 100 Mbps (IPB), which has no recording time limit*1 *2. You can freely choose the format from MOV, MP4, AVCHD Progressive and AVCHD at a variety of frame rates according to the usage. In MP4 / MOV, high quality sound in LPCM (Linear Pulse Code Modulation) is recordable. *1 Motion image can be recorded up to 29 min 59 sec depending on the recording format and the camera’s sales area. *2 Use SDXC/SDHC Memory Card compatible with UHS Speed Class 3 (U3) when using high bitrate video recording mode over 100 Mbps. Selectable System Frequency For the global business of professional users, the system frequency can be flexibly selected from 59.94Hz (23.98Hz) / 50.00Hz / 24.00Hz. Real-time Output via HDMI The DMC-GH4 is also capable of real-time image output (4:2:2 / 8 bit or 4:2:2 / 10 bit) to the external monitor via an optional micro HDMI cable*. It is suitable for the professional video making that requires serious monitoring of the imageries. Users can choose to output only the recording content or the content with the setting menus individually depending on a display.When using 4:2:2/10-bit output, simultaneous video recording on SDXC/SDHC Memory Card in the camera is not possible. When using 4:2:2 / 8-bit output, video is recorded in 4:2:0 / 8-bit on SDXC/SDHC Memory Card in the camera. VFR (Variable Frame Rate) The VFR (Variable Frame Rate) enables recording video with slow/fast motion such as 96 fps / 4x*, all in Full-HD. See specifications for more effect options. *In 24p playback. Time Lapse Shot / Stop Motion Animation Time Lapse Shot and Stop Motion Animation are available for stationary observation for subjects or for producing a stop motion (stop frame) video with sequential pictures. Both can be produced in camera without needing postproduction process. Zebra Pattern It indicates overexposed area before / during shooting and the pattern can be output to the external monitor, too. Master Pedestal It allows adjustment of the brightness balance ±15 steps based on the color of black. Cinelike Gamma “CINELIKE D” and “CINELIKE V” are newly available for expressive tone like a cinema. Synchro Scan It is practical for suppressing flicker over the TV / PC monitor or fluorescent lights. Center Marker By displaying it at the center of the viewing angle, center marker works as guide mark for video image composition. Color Bars Color Bars (SMPTE / EBU / ARIB Standard) can be the benchmark to fix the color or brightness. 1KHz Test Tone can be the bench mark to fix the sound volume. Time Code SMPTE-compliant Time Code either in Rec Run or Free Run count-up methods makes it easy to synchronize the multiple video footage or sound source in the post production workflow. Professional Video Contrast AF with DFD Technology The Contrast AF system is advanced with the DFD (Depth from Defocus) technology which even shortens the time to focus. It figures out the distance to the subject by evaluating 2 images with different depth of field while consulting the data of optical characteristics by using lens in a moment. As a result, ultra high speed AF of approx.0.07 sec* is achieved. This improvement benefits more as focusing distance increases. *In AFS, with H-FS14140 or H-HS12035 High-Speed Burst Shooting The DMC-GH4 boasts high speed burst shooting at 12 fps(AFS) with the maximum recordable images of up to approx. 40 (including RAW) / approx. 100 (excluding RAW) and 7 fps (AFC) to capture fast moving subject just in-focus. Together with the quick start-up and short release time lag, the DMC-GH4 never lets you miss fleeting shooting opportunities. 49-Area AF Focus point is increased from 23 (DMC-GH3) to 49 points for more flexible composition. Custom Multi AF Custom Multi mode in which you can freely select the blocks to focus out of the 49 focusing area. New Face / Eye Detection AF In addition to the conventional Face Recognition AF, the DMC-GH4 newly incorporates Face / Eye Detection AF which automatically sets focus right on the face or eye in face. Seamless Magnification of 1-Area Focus Point Now the 1-area AF area can be seamlessly magnified not only in manual focus but also in auto focus mode. Dual OLED Displays – LVF & Monitor The DMC-GH4 boasts newly developed high-precision, high-speed dual OLED (Organic Light-Emitting Diode) displays for 2,359K-dot LVF (Live View Finder) of approx.1.34x / 0.67x* and 3.0-inch 1,036K-dot free-angle rear monitor. They achieve high speed response with minimum time lag while enhancing the resolution. Notably, the OLED for the LVF boasts 10,000:1 high contrast for superior color reproduction. *35mm camera equiv. Magnesium Alloy Body & Rugged Design To be tough enough to withstand even heavy field use, the main structure of the DMC-GH4 is composed of magnesium alloy full diecast front / rear frame. It also features splash / dustproof construction thanks to the sealing on every joint, dial, and button. High Performance Shutter Unit The shutter unit is also redesigned to be even more durable for approx. 200,000 times release*. It offers highest shutter speed at max. 1/8000 not only to capture spur-of-the-moment for fast moving subject but also to use high-speed lens with open aperture even in outdoors to give impressive defocus. Both built-in / external flash can be synchronized with max.1/250 second shutter speed. *Panasonic in-house examination. Optimum Layout of Control Components For quick, intuitive control, 3 dials are equipped on the top and back of the camera and the main dial is now comes with lock structure. A dedicated button allows direct reach to exposure compensation, white balance adjustment or ISO setting and max.5 settings can be assigned to the Fn button. All these external components are designed to be operated easily without taking eyes off from the viewfinder. Terminals for Expanded Connectivity The DMC-GH4 comes with a variety of connection terminals. The 3.5mm microphone and the 3.5mm headphone jacks. It is also capable of real-time image output on the external monitor via an optional HDMI micro cable simultaneously while recording video. In addition, AV outputs, flash sync terminal and 2.5mm jack for remote controller are available. It complies with the SDXC / SDHC Memory Card UHS Speed Class 3 (U3). Wi-Fi® with NFC Technology The DMC-GH4 integrates Wi-Fi® connectivity (IEEE 802.11 b/g/n) with NFC (Near Field Communication) technology. With the “Panasonic Image App”, remote shooting of photo / video is available with smartphone / tablet. It is also easy to embed geotag in the image after shooting. For the smartphone / tablet without NFC, the camera displays dedicated QR code on its monitor to complete pairing easily by reading the code. New Interface Unit (Optional) The Interface Unit(DMW-YAGH) is offered exclusively for professional / industrial workflow enabling more powerful video transmission. It complies with Full HD (4:2:2 / 10 bit) four parallel output or 4K (4:2:2 / 10bit) output, both with time code*. The 2ch XLR input terminals are also equipped for line or condenser microphone. Microphone volume can be controlled L / R separately. It compies with 12V DC IN. * When using 4:2:2/10-bit output, simultaneous video recording on SDXC/SDHC Memory Card in the camera is not possible. An unprecedented combination of versatility and Full HD image quality The unique XF105 is Canon’s smallest camcorder to include an MPEG-2, 50Mbps, 4:2:2 Full HD codec. Studio connectivity, professional audio and extensive customisation provides exceptional versatility. 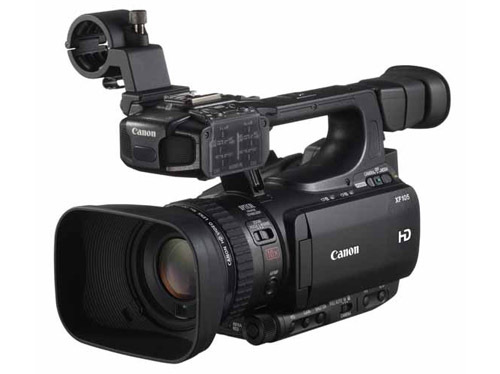 MPEG-2 recording to 2 CF cards at up to 50Mbps (4:2:2) Light, compact design; XLR inputs 10x zoom Canon HD Video Lens 1/3 type Full HD Canon CMOS HD-SDI, Timecode, Genlock; 3D Assist Functions 8.8cm (3.5’’) 920k dot LCD; 0.6cm (0.24”), 260k dot EVF Variable frame rates MPEG-2 recording at up to 50Mbps (4:2:2) The XF105 records MPEG-2 MXF (Media eXchange Format) files – up to 1920 x 1080 Full HD at 50Mbps (4:2:2) – to relatively inexpensive and widely available CompactFlash (CF) memory cards. Relay Recording across two card slots allow filming to continue without interruption, whilst Double Slot Recording lets you store the same footage to both cards. Light, compact design; XLR inputs Putting exceptional functionality in the palm of your hand, the durable and lightweight design enables exceptional versatility. Linear PCM audio can be captured via twin XLR inputs and also using the front-mounted stereo microphone. 10x zoom Canon HD Video Lens Drawing on Canon’s broadcast lens expertise, XF105 features a fast, wide angle Canon HD Video Lens (f1.8-f2.8, 30.4mm) with built-in control ring for adjustment of zoom, focus or iris. An enhanced Optical Image Stabilizer system helps to reduce chromatic aberration, maintain sharpness and reduce lens size. 1/3 type Full HD Canon CMOS A 2.07MP Full HD CMOS sensor – designed and manufactured by Canon – captures Full HD video at native 1920×1080 resolution. The sensor is equipped with a Bayer pattern colour filter for high sensitivity and wide dynamic range; high-speed data readout technology minimises rolling-shutter skew that can occur in CMOS camcorders. HD-SDI, Timecode, Genlock; 3D Assist Functions HD-SDI output is the industry standard, outputting uncompressed Full HD with embedded audio and Timecode. A combined Genlock In and Timecode In/Out terminal allows the XF105 to be used in a multi-camera shoot. Genlock and 3D Shooting Assist functions (OIS Axis Shift and Focal Length Guide) support stereoscopic 3D video capture using two camcorders. 8.8cm (3.5’’) 920k dot LCD; 0.6cm (0.24”), 260k dot EVF Both camcorders feature a large, side-mounted LCD. This 8.8cm (3.5”) screen has a sharp, 920k dot resolution, with a built-in waveform monitor and Edge Focus function to help set up the shot. A 0.61cm (0.25’’), 260k dot EVF with 100% coverage is also available. Variable frame rate A wide range of frame rates is available, from 12 to 50 fps. This gives cameramen the freedom to alter the capture rate for additional creative flexibility. 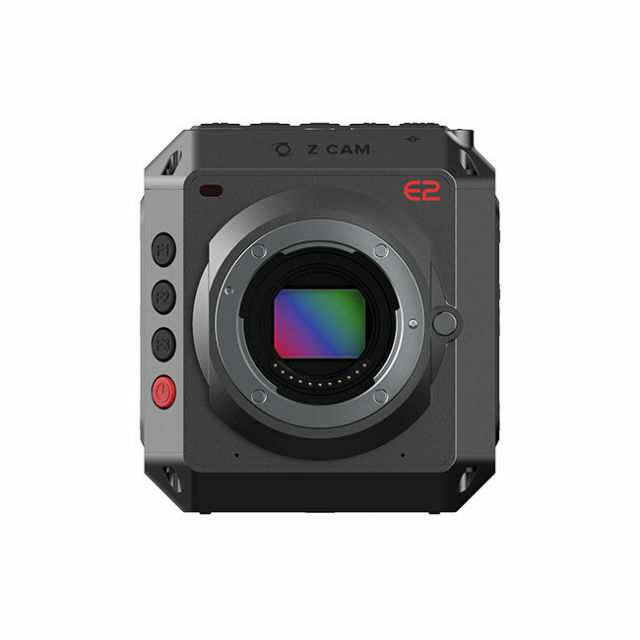 The E1 by Z Camera gives 4K (4096×2160) image quality from a camera with dimensions no larger than that found on an action camera. Housed in a magnesium alloy body, it is lightweight and therefore ideally suited to POV and aerial (UAV) photography. It records 4K movies (4096×2160) as well as UHD (3840×2160) at a bit rate of 60Mbps. In addition, the E1 can record Full 1080p HD movies at up to 60fps, and 720p with the ability to record at 240fps in this lower resolution format but then with the option of presenting slow motion playback. Due to the power of the Panasonic imaging sensor, the E1 is also capable of recording 16 megapixel still images with an option of recording in RAW. 3D noise filters also ensure lower noise levels in low lighting conditions, especially important when making the most of the maximum ISO sensitivity of 25,600. Burst shooting at up to 15fps is also attainable. In both still and movie recording modes, the E1 will autofocus continuously, with user-defined variation in focus sensitivity. For manual focusing, there is even a zoom-in feature to ensure focus is pixel-sharp. This camera is suitable for both Wi-Fi and Bluetooth camera control by mobile devices using Android or iOS operating systems, as well for monitoring and powering on or off, giving you a true remote control option essential to UAV and POV applications.